NEGROMANCER 2.0: DC Comics Announces New "Fables" Comic Book, "Everafter"
DC Comics Announces New "Fables" Comic Book, "Everafter"
Beginning this September 2016, a new chapter of the Fables legacy will begin with EVERAFTER: FROM THE PAGES OF FABLES. A new monthly Vertigo comic book —from the creative team behind the acclaimed digital-first series FABLES: THE WOLF AMONG US, writers Matthew Sturges and Dave Justus, with artwork by Travis Moore and covers by Tula Lotay — EVERAFTER takes place after Bill Willingham and Mark Buckingham’s beloved Eisner Award-winning series. 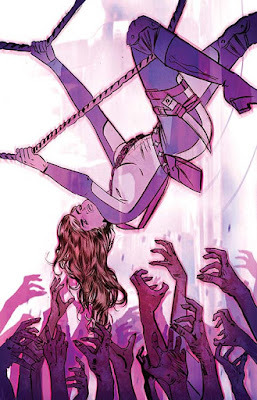 "EVERAFTER is a spy thriller featuring a covert-ops team whose mission is to save this newly magical world from itself," explains co-writer Dave Justus. "The story has a uniquely Vertigo flair, filled with twists, double-crosses, and agents willing to give their lives for (fairy) queen and (goblin) country!" "We've always hated that feeling of getting to the end of a great book and wondering, 'But then what happened?'" says co-writer Matthew Sturges. "Bill Willingham planted so many seeds in the final issue of FABLES that it was impossible for us to let it lie." In a post-FABLES world where magic abounds, it can be wielded for the greater good or used to sow the ideas of anarchy and terrorism. Enter The Shadow Players, a global network of agents—both Fable and mundane—tasked with policing a newly enchanted world and protecting humanity from itself. The series will feature fan-favorite characters, including Bo Peep, Peter Piper, Hansel, and Connor Wolf, as well as exciting new characters and a terrifying new villain. "EVERAFTER is an extraordinary opportunity for us to build onto the stories of characters from FABLES that we love, offer new revelations, flesh out the lives of some lesser known characters, and bring brand-new Fables into the mix," explains artist Travis Moore. "For me, it's always a joy to get to design new characters; I'm bringing a more dynamic action style to the FABLES community than fans have seen from me." "The terrific job Matt Sturges, Dave Justus, and Travis Moore did on the comic adaptations of the Wolf Among Us video games made them the perfect team to carry this new spin-off series," says FABLES creator Bill Willingham. "There are some terrific surprises ahead in a world that is no longer mundy. What happens in a world that now knows about Fables and the sharp rise of magic in their midst? EVERAFTER is going to show us."